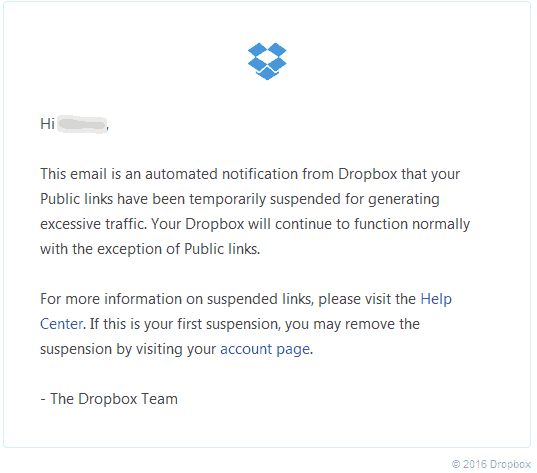 On 2/22/2016 – We received an e-mail stating that the Dropbox account is now suspended due to high traffic bandwidth. We looked at the metrics of this site and found that the traffic has been unchanged for months. So proceeding to google and looking up how many websites had hot-links just the binaries of this website and there’s tons of YouTubers out there which were obviously too lazy to setup their own Dropbox account and instead simply hot-linked to my account for their users to go ahead and download everything from. Dropbox links will be deleted. I’m not even going to bother reinstating the account so YouTube assholes “Content Creators” can continue to get download links for their channel. Links to binaries will be locally hosted and with anti-leech protection enabled. I didn’t want to do this, but the internet has left me no choice in this matter. Blog entries with binaries hosted will be redirected accordingly. We will attempt to list the blog articles which contain binaries accompanying them. XBCD and windows 10 installation. OpenSimulator running on Raspberry Pi/ARM based processors. I encourage people to share my blog entries for artwork or any tutorials that I have on this site. What I do not encourage is people using my web-space as their own to take credit for or to give a user the illusion that the file maintenance and upkeep is done completely by them when in fact the files hosted are coming from this website. If you want to download anything off of my site, be sure and visit the downloads section if it is something that was created here. Also, be sure and check out the blogs and guides section for any binaries that are linked to anything that was discussed here. Or simply go to the main menu to check out some of my articles and art. Finally, do not forget about the search bar both in the footer and there’s a icon on the top of this site as well. Typing the binary name will more then likely get to to the article where you can download the binary. Thank you for understanding and may server protect you. Apologies for that. Due to some security updates we had to change cache software which affected direction. we just got done resetting everything and downloads appear to be working from both our home office and remote proxies. clear your cache and give it a try again.